Image size 26" x 20", frame 33" x 27"
Michael Newberry will donate 20% of the purchase price of Mario to assist Enlightenment. Michael Newberry will donate 20% of the purchase price of Susanna to assist Enlightenment. 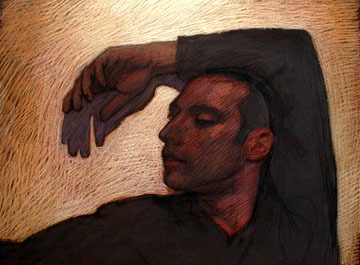 You can view an archive of his work, read more about him, and stay posted with his Studio Updates at www.MichaelNewberry.com. About this Portrait: The medium is Rembrandt soft pastel on black Canson paper and the pastel has been protected with Talens fixative. It is framed in an unpolished, 3 1/2" wide, black stained wood with plexiglass. The surface of the plexiglass is set off about 3/8" from the surface of the drawing, guaranteeing that pastel does not rub off onto the plexiglass. Susanna is from a series of pastel portraits that Newberry is making of friends who live on Rhodes.